Rackmount kit for rackmount monitor & rackmount TFT LCD: Rackmount display kits. Rackmount kit for TFT LCD monitor. We design and fabricate cost-effective solutions for rackmount monitor requirements. 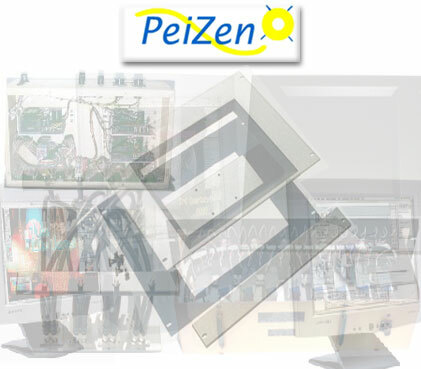 We at PeiZen (pronounced pay-zen) provide the widest selection of LCD rackmount monitor kits for TFT LCD monitors. We have rackmount monitor kits for 15", 17", 18.1", 19", 20.1" and 21.3" TFT LCD monitors. Our rackmount monitor kits are easy to assemble and they look great. The feedback comments from all of our customers have been very positive. We can provide custom designs for application specific electronic hardware. Please click on Products and Services. to see what we can do for you. For more information, please contact us at ml@peizen.com or call (805) 383-8855.